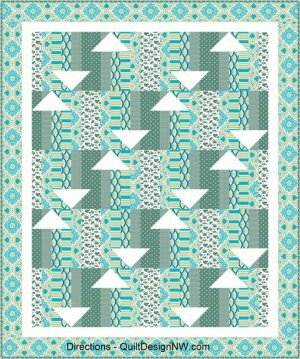 Directions is an easy-to-sew, rotary-cut and machine-pieced quilt. Use fabric in gradations of value going from medium light to medium dark with a very dark fabric for the ‘arrows’ pointing the direction (as in the black & white cover quilt), or go from a medium dark to a medium light fabric with a very light fabric for the arrows. Fabrics can all be in one color family or a variety of colors for a different look. Either way the arrows point the direction.